Northfield has long enjoyed a vibrant local music scene. In recent years, Gospel Gossip, the Big Wu and Afternoon Records have raised our visibility regionally, however, the story goes back to the late ’60s and early ’70s, when there were many bands and frequent dances, perhaps best symbolized by the 1978 Jesse James Music Festival. 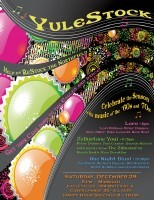 This Saturday night (December 29th) there will be a celebration of Northfield’s local music scene. 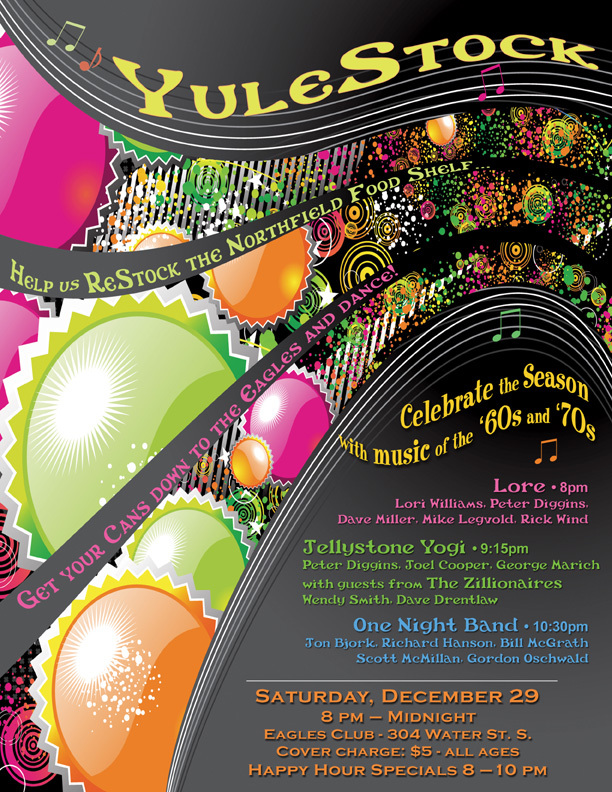 Hearkening back to that golden age, a number of local bands and musicians will present YuleStock, an evening of ’60s and ’70s rock and blues music on Saturday, December 29, 2007 from 8 p.m. to midnight at the Eagles Club Main Hall, 304 Water Street South in Downtown Northfield. All ages are welcome. There is a cover charge of $5 per person and the public is asked to bring non-perishable food items to help restock the Northfield Community Action Center Food Shelf. The artists performing include: Lore, featuring Lori B. Williams (alto sax, guitar, piano, vocals), Peter Diggins (guitar, vocals), Dave Miller (keyboards), Mike Legvold (bass) and Rick Wind (drums), Jellystone Yogi featuring Diggins on guitar, Joel Cooper (bass) and George Marich (drums) and joined by members of The Zillionaires, Dave Drentlaw (drums) and Wendy Smith (guitar, accordion) and, an authentic link to that bygone era, The One Night Band, featuring Jon Bjork (guitar, vocals), Richard Hanson (drums), Bill McGrath (bass, vocals), Scott McMillan (guitar, vocals) and Gordon Oschwald (guitar). So come on Down(town) on Saturday night to the Eagles Club and dance, watch, or just listen like you did thirty some years (or thirty some days) ago.